Chester Springs, PA – (November 12, 2018) – With the terms of two advisory members expiring, Azione Unlimited announces the election of two new members. Effective immediately, JW Anderson, president of The Integrated Home and Al Reinhard, principal of AHT Global, replace Kim Michels of Electronic Environments and Jason Voorhees of Cantara Design. Michels has held a board position since 2014 and Voorhees has been on the board since 2015. Azione’s unique and mutually beneficial business model strategically positions dealers and vendors as equal members. As such, both are represented equally on the Azione board, which is comprised of five vendor members and five dealer members. Responsible for helping guide the future of the group, the Azione board is nominated by the membership, and each member serves approximately a 3-year term. 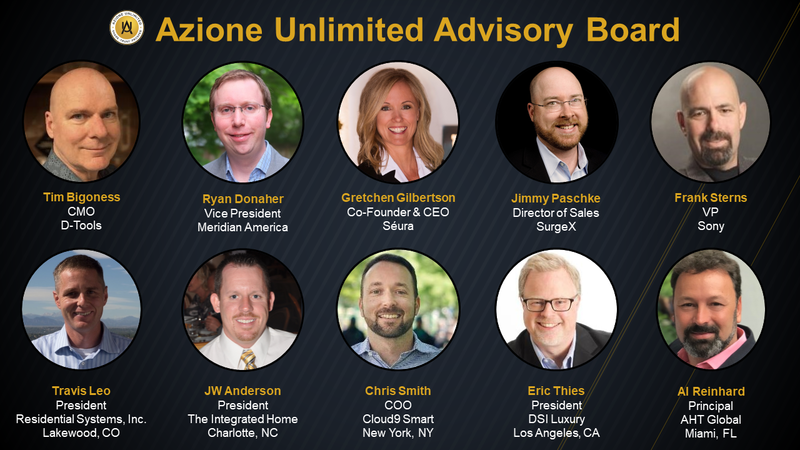 Other current members of the Azione Unlimited Advisory Board are: Travis Leo, Residential Systems, Inc; Eric Thies, DSI Luxury Technology; Chris Smith, Cloud9 Smart; Ryan Donaher, Meridian Audio; Tim Bigoness; D-Tools; Frank Sterns, Sony; Jimmy Paschke, SurgeX; and Gretchen Gilbertson, Séura. Azione Unlimited, the education and buying group for integrators, is a consortium of like-minded custom installers, home technology professionals, and vendors. The organization helps its members achieve greater levels of prosperity, technical acumen, and sophistication in running their businesses and serving customers. Founded by industry veteran Richard Glikes and headquartered in Chester Springs, PA, the organization is celebrating its sixth year. In addition to two high-energy, information-packed conferences per year, Azione provides its members with a host of benefits, from product discounts to educational middle management meetings, and marketing tools. Learn more at AzioneUnlimited.com.